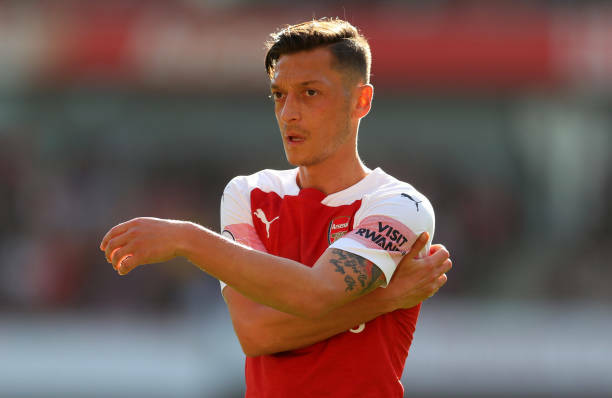 Arsenal manager Unai Emery must axe one of two first-team star players, Mesut Ozil or Henrikh Mkhitaryan according to former striker turned pundit Tony Cascarino. Cascarino does not believe Ozil and Mkhitaryan can both play in the same team and feels Emery has a tough call to make. Emery has been urged to keep Nigeria international Alex Iwobi in the side. “Arsenal feel like a completely different club under Unai Emery and one of the main reasons for that is that the fans believe in the team now,” he told The Times. “The disgruntled atmosphere at the Emirates used to be a problem for Arsenal, now it’s the opposite. “’Spineless’ seems to be one of the words of the week in the Premier League and under Arsene Wenger, the minute Arsenal went behind the fans would think ‘here we go again’. “Under Emery, they have won more points from losing positions than any other team, so the fans stay with the players. “But I cannot see how Emery can keep both Henrikh Mkhitaryan and Mesut Ozil in his team, given that power and tempo seem so important to the way he wants to play. Ozil and Mkhitaryan both started for the Gunners in the 1-1 draw against Liverpool at the Emirates on Saturday. The playmaker of Turkish origin was named captain for the third league game in a row. The 30-year-old is the highest paid member of the Arsenal squad and considering he has also been named captain it is difficult seeing Emery drop his star man. Ozil has four goals and one assist in all competitions this season. Mkhitaryan meanwhile has gone goal and three assists in 12 appearances for the North London based outfit.